Bear took me to Red Lobster this recent weekend. He was brandishing his $50 gift card award from work, so off we went to have a feast. Thank you, Bear. This is Red Lobster's Ultimate Feast. It's absolutely filling and for someone who indulges in crab or lobster once or twice a year, this plate is simply gorgeous. 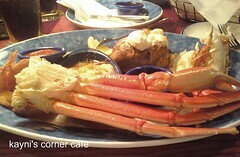 I love the steamed snow crab legs, garlic shrimp scampi (a favorite) and Walt's favorite shrimp. My only complaint is that I found the split Maine lobster tail too salty. The meal was great, but I think I can only manage to indulge with this huge serving once a year. It was just too much food for one meal. i love seafood! :) yum! i have yet to try lobsters. how different is it from crabs, or alimasag, in terms of taste? I love seafoods too, KG, punta na dito sa Gensan! Dali!